Handcrafted Jobs and Trades Presents…. Calling all Hunters, Warriors, and anyone else who can hit a target…Here is your opportunity to prove your marksmanship and superiority as a hunter/warrior. Live up to those stories you have been spreading at the Salty Swallow. Bring your weapon of choice – and that would include anything that can be thrown, tossed, blown or fired. We are talking bows, blowguns, axes, knives, swords, hatchets or even rocks. In fact, bring anything that will stick in a target that isn’t screaming when you throw it. However, please keep in mind that this is a gentlemanly sport and gentlemanly conduct will be expected – even for the Warriors. We are strongly discouraging the use of ‘live’ weapons. Contestants can mix and match their weapons (toss an ax, fire an arrow, throw a knife). All weaponry subject to inspection and approval. Representative(s) from the Crone’s Eye will be on hand to check weapons and judge the event to ensure that magical means or charms are not used to improve your odds. For information on the marksman rules for this upcoming Event, go here to read the forum thread. 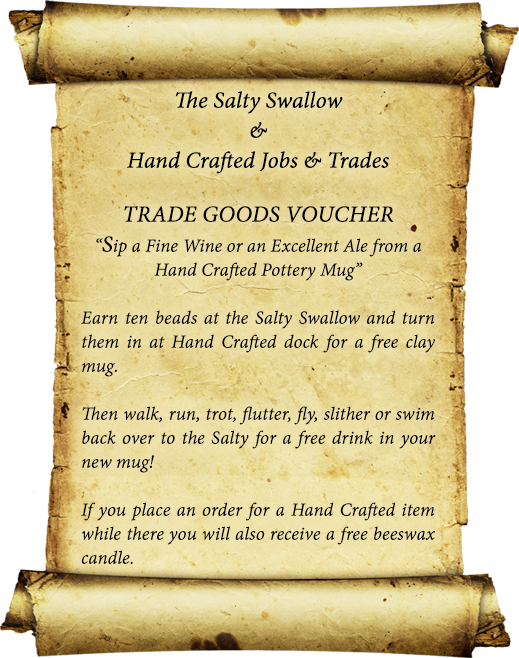 Earn ten beads at the Salty Swallow and turn them in at Hand Crafted dock for a free clay mug. Then walk, run, trot, flutter, fly, slither or swim back over to the Salty for a free drink in your new mug! If you place an order for a Hand Crafted item while there you will also receive a free beeswax candle.